About a month ago, I received a new ARM dev board, a IFC6410! Which despite the boring sounding name is quite an impressive bit of kit. About $150, quad-core krait, 2G DDR, SATA, gigabit ethernet.. and adreno a320. It is basically the same SoC that is in the nexus4 (or the new nexus7). But in more convenient form factor for development. And with this board that I've been developing a new msm drm/kms driver. 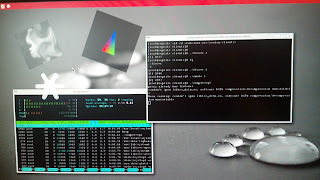 For a while now, freedreno has been limping along with the msm fbdev and kgsl drivers from their android kernel tree, while I focused on the userspace gallium driver and ddx (xf86-video-freedreno). But that was always a short-term solution.. with the qcom android drivers, I can't really handle synchronization between processes, which gets really crazy w/ x11 and compositing window manager where you have sharing in both directions (as texture and/or render target), I can't handle page flipping (let alone page flipping synchronized with the GPU), and have general robustness issues. Unfortunately, the msm android fbdev driver code is a real mess (at least the mdp4 parts). Even by android / vendor kernel standards, which are pretty low to begin with. And I don't have any docs on the display controller. In the end, I ended up instrumenting the code to trace all the register reads/writes, etc, wrote a small parser tool using envytools/librnn, and starting writing rnndb register database for the display controller registers. It was a lot easier to get a general picture of how the hardware works that way! Plus I can generate register level headers from rnndb in the same way I do for the gallium driver. Rob, awesome work! Question though, were you able to try Freedreno with i.MX53 AMD Z430/Z160 (as you know this is basically Adreno 200)? Or at least do you know anyone reporting to have it working? Is a co-existence of both drivers possible? fbdev/kgsl for android and drm/kms for linux chroot. I don't think so.. this is why I keep support in the userspace bits for fbdev/kgsl. fwiw, drm/kms driver doesn't yet have support for any dsi/lcdc or any of the lcd panels in any android devices. Only hdmi so far, although I do plan to add dsi and/or lcdc support and panel support for a couple devices that I own.. but the focus will be booting linux natively. There isn't really any sane way to share the display or gpu hw blocks between fbdev+kgsl and drm/kms. This is rather disappointing to hear. :( I've recently discovered that EXA won't work on the Galaxy S4's SoC (APQ8064T), because it doesn't have support for kgsl_2d0 anymore. I have freedreno working, but without EXA it seems rather pointless. My next hope is the drm/kms driver, so I'm beginning to look into your source code to get this to work. So far, it just causes my device to reboot when the freedreno driver is loaded (still looking into that). Unfortunately, booting into native linux on the Galaxy S4 is rather difficult (if possible at all) because we have locked bootloaders. As you may have heard, an exploit was found that allows us to install custom kernels, but that's about it. I look forward to watching the progress on this project, and I will continue to toy around with everything you've provided, in an attempt to get it working for the Galaxy S4 community. There *is* some experimental XA support (using 3d core for doing EXA 2d operations), although it has some issues which I've not had time to debug. That will most likely be the approach to get 2d accel on devices without a 2d core. Older versions of the DDX/libdrm work fine but without EXA, and of course the BGR colors. The fbdev driver has similar results, but is mostly useless for me. 3) I'm missing something? A replacement kernel driver or something? I'd love to work with you more on this. I have been documenting everything, and I can paste-bin anything or whatnot. I'll continue to fiddle with this more. Thank you SO much for your time responding! - The framebuffer is /dev/graphics/fb0, but I've edited xorg.conf for this. Other than that.. well, I guess you're mesa config doesn't matter *yet*. It would be useful to pastebin the kernel traces (dmesg), that might give some hint about what is going on. Used the n4 example to work with devtmpfs, and that seems to bring things much more in-line with your setup, including /dev/fb0. Thank you for the tip! Also nice to know that I don't need to fret with Mesa at this point. I had assumed part of the problem may have been that it was missing or otherwise not built right. What would be your preferred method of gathering the dmesg output? I assume just "dmesg > dmesg.txt", but considering I don't get any opportunity before the device resets... is there a way to capture this on-the-fly? if you get a chance to dump log before reboot, then 'dmesg > dmesg.txt' does the trick. I usually increase CONFIG_LOG_BUF_SHIFT to 21 in the kernel config so that the kernel traces don't get truncated as soon. Appears I already had CONFIG_ANDROID_RAM_CONSOLE enabled in my kernel, so that made things easy. Here's a download link for the output of last_kmsg after it rebooted. Using the master branch of libdrm, and using the msm-drm branch of the ddx. Ubuntu 13.10, stock "mf3" android kernel with the kgsl and devtmpfs modifications. Again, I really appreciate the help. what branch names I should use to test xorg on Ifc6410 ? That branch should work.. (or there is the newer ifc6410-drm branch with the new kernel driver). Either way, I recommend starting with ifc6410_rob_defconfig as the android config misses a lot of things. In this case, I suspect you miss CONFIG_VT or something along those lines. i used the "ifc6410-boot-drm.img" & "ifc6410-freedreno-drm.tgz" to bring up the gdm. when i do "systemctl start gdm", i get "error: msm mdp.0: failed to load a3xx gpu"
Thank you very much for the work you've done with our board. Using this new DRM/KMS driver will it still be possible to run Android and a Linux distro in chroot? Or Android will always need fbdev/kgsl? Thank you for all your efforts!! well, I suppose it is possible to use mesa+kms with android.. I think this is what the android-x86 folks do.